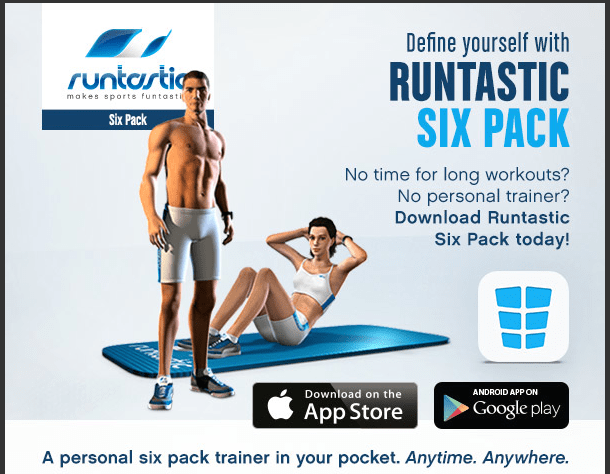 This is the promise of Runtastic’s new app, Six Pack. I thought I’d give the free version a whirl. Here’s what I thought. Since the Six Pack lite version is free (and only $4.99 to upgrade to the full version) downloaded it and started day 1 immediately. I pushed it up to my Apple TV and hit play. And… easy. Day 1 was easy. I was embarrassed at how easy it was. 3 exercises with 3 sets each with 8 reps each set and an optional bonus round (which I did). 80 crunches. It was fabulously easy. Day 2 came, and easy peasy. 10 reps this time. Day 3 – now I felt it. 12 reps this time. Each day added 2 reps and rotated the exercises. I rested my abs for one day, and continued with Day 4. The exercises were starting to work, and I could see some results in the mirror. Or my imagination did. Around Day 5 or 6 the exercises changed up. Today I competed ten days of Level 1 Training and finished off the morning with 234 repetitions of abdominal exercises. AND I CAN DO IT. And I like it. If you haven’t figured it out yet, I like the app a lot and I plan to continue using it. I’ll upgrade to the full version very soon. I like that it isn’t an intense program that things you can do 325 sit ups as a beginner, or even mid-level fitness seeker. I like that you can choose between a male or female CGI model. The male – Daniel – is shown in the pics here. I like that it works with Apple TV (although this is a function of AirPlay, not the app). I like that the lite app starts you from an easy place and moves you forward. I like the changes in music for different sets. I also like that I can do an in-app purchase for new music packs. I like that if you want a little more intensity of work out, you can get that too. I like that the app and program are well thought out and put together. This not a quick hack App trying to make a buck. I wish I had taken “before” pictures, since I can already see a difference in my abs after finishing Level 1. I don’t like that if you choose to skip some of the rest time (30 secs) between sets, on a second set of three, the app can’t seem to count the rest and the counting is off for the first few reps. I saw that nightmare coming and immediately switched it around in my head. This made the workout a bit more bearable – doing working the same abdominal group four times in a row (104 reps) would be too much for me to handle. So just a thought, Runtastic, if you’re reading, check the order of the predetermined workouts. With the full version I’ll be able to set up my own stuff, but for now I’m happy following and adjusting. Even if I don’t like the order, I trust that someone who knows a bit more than I do about abs fitness sets up the routines, and I’m ok following their lead for now. So: while I’m still new to the app, I highly recommend it if you are interested in better abs, a defined midsection, and if you’re up for solid – not cheesy or flimsy – abdominal program. Well done, Runtastic. Update: I purchased the full version so that I could progress into level 2. Still like it! 🙂.